The ‘Observation Card’ helps volunteers to record the right observations of endangered species. Oranjestad- According to STENAPA, St. Eustatius has a particularly rich underwater nature. However, marine life is under pressure of human activities. The ANEMOON Foundation will now start a project to make an inventory of the underwater nature with citizen scientists. In 2015, a good start was made during the ‘St. Eustatius Marine Biodiversity Expeditionary 2015’. During this expedition the ANEMOON foundation, together with the Naturalis Biodiversity Center and local partners, mapped the underwater life. Within three weeks, over 1,150 different species of plants and animals were observed in the marine park. To be able to advice on the sustainable management of the underwater life in the future, it is important to monitor the changes and the distribution of species over time. The ANEMOON Foundation is a Dutch volunteer organization of citizen scientists interested in marine nature. In the Netherlands, ANEMOON has a successful long term project to monitor the marine nature with an extensive network of active citizen scientists (volunteers). The ANEMOON foundation would like to setup a similar project on St. Eustatius. The project, developed in close collaboration with STENAPA, aims to support tourists, expats and locals to count endangered and exotic marine species. By giving workshops and supporting volunteers, ANEMOON wants to achieve public awareness for the underwater life on St. Eustatius. We hope this awareness will result in more volunteers interested to participate in this project. Everyone making a dive or snorkel trip on St. Eustatius can easily contribute. This is possible by using the ‘Observation Card’ with 12 characteristic good recognizable species, developed by the ANEMOON Foundation and STENAPA. Together, these species are a good indicator of the health of the marine nature around St. Eustatius. The card for example includes sea turtles, a shark and a ray and species which are vulnerable everywhere in the Caribbean. Happily, around Statia the opportunities to observe these species are still good. After a swim or snorkel trip you can indicate on the card which species you have seen. Of course there is much more to see than the 12 species on the Observation Card. The enormous variety of species, colors and shapes is brought together in a beautiful “Field Guide of the Marine Life of St. Eustatius.” This guide contains photos of 234 species all photographed around the Island. A free download of this field guide is available at www.anemoon.org/eux. 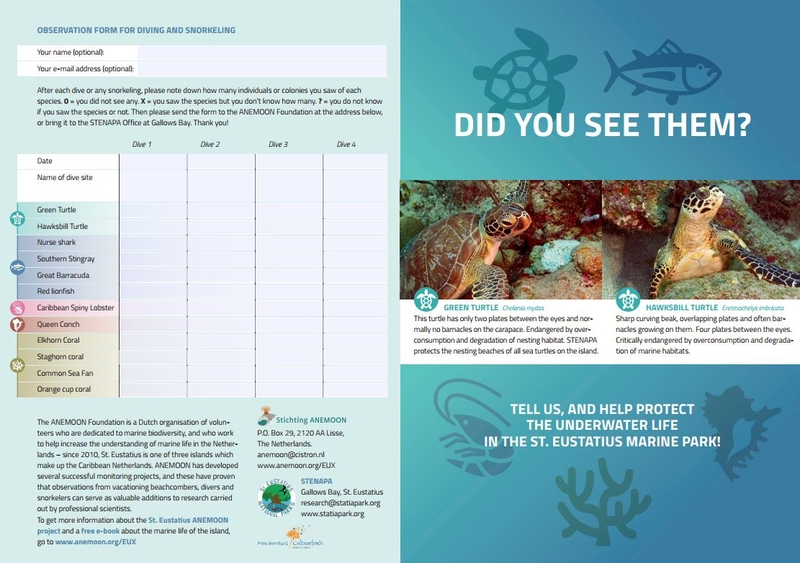 More extended information on the marine species of the Dutch Caribbean is available on the website of the ANEMOON Foundation. For very active divers, snorkelers and beach combers, an extended observation form with 150 species is also available. More information about the project ANEMOON Foundation can be found at www.anemoon.org/euxnl (in Dutch) and www.anemoon.org/eux (in English). For more information about STENAPA and the marine park, look at www.statiapark.org. This project was supported by a the Caribbean department of the Prince Bernhard Cultuurfonds.